You are here: Home / Entertainment / PEEP, Día de los Niños- Twitter party! PEEP, Día de los Niños- Twitter party! Did you know that each year the United States Congress names April 30th as El Día de los Niños? It’s a great effort meant to support the intellectual and emotional development of young people. More than 100 cities across the nation will celebrate this day with parades, book festivals, hands-on activities, and more! To see a list of El Dia de los Niños events around the country, visit http://www.nlci.org/programs/DLN/Main/Map.html. Peep and the Big Wide World has been appointed as the featured guest at this year’s El Dia de los Niños celebrations. A science and math series for preschool age kids, it’s a sweet cartoon that my daughters love. Available in Spanish on V-me, Peep has expanded its bilingual episodes and activities, and will even be launching a new website soon. 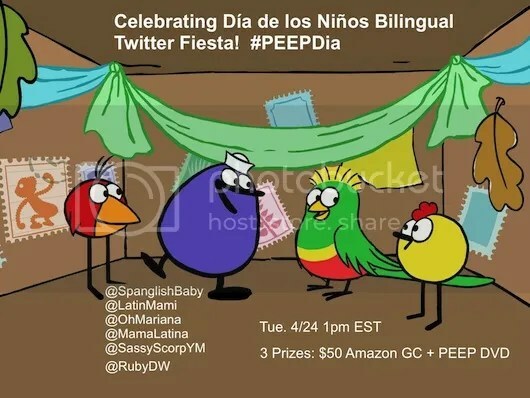 Join us to celebrate Día de los Niños on Twitter with @peepchirpquack! Hashtag #PEEPDia. You can also follow the party on Tweetchat here. To be eligible to win, you must join the party and participate during the hour with an original tweet (RTs not eligible) using the #PEEPDia hashtag and answer the giveaway questions. Disclosure: I’m being compensated to co-host and promote the Twitter party, but all opinions are my own.